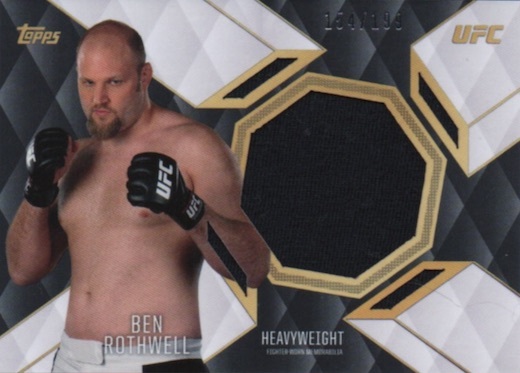 Outside the signed cards, Top of the Class Relics (over 30 subjects) offer a jumbo piece of fighter-worn gear or fight-used mat and drop in every box. Silver (#/25), Red (#/8) and Gold (1/1) parallels provided added rarity. The only non-hit in the product, Top of the Class Inserts (1 per box) document current and past champs as well as current contenders. Again, Silver (#/25), Red (#/8) and Gold (1/1) parallels are in play along with unnumbered Black parallels. 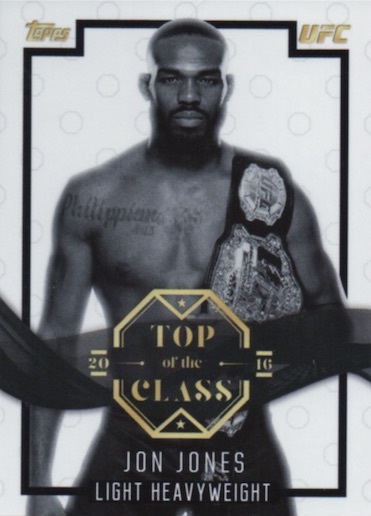 Collectors can also find exclusive 2016 Topps UFC Top of the Class wall art editions though the Topps Online Store. PARALLEL CARDS: Silver #/25, Red #/8, Gold 1/1. 49 cards. Serial Numbered #/199. PARALLEL CARDS: Black, Silver #/25, Red #/8, Gold 1/1. Good: Quality card stock, lower box price for two autographs and one relic, appealing design. Bad: Weaker overall signers list, stickers and unnumbered autographs galore, brand does not really do a good job of establishing an identity. The Bottom Line: While three hits, including two autographs, for $45-50 per box is not bad, this new product feels like the same old thing in an updated package. Part of the job of any new product is essentially making the case for why the cards deserve a spot in your collection. It is hard to make that case as nothing really stands out and most boxes will yield two autographs worth a few dollars, along with two inserts that are virtually worthless and a dollar relic. 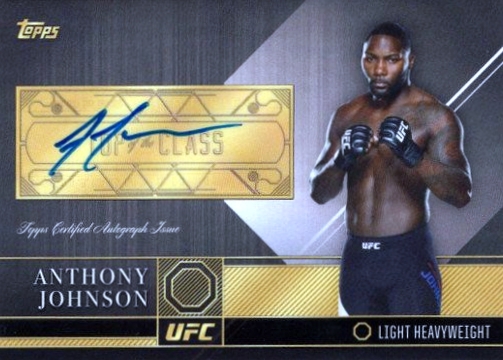 On the plus side, 2016 Topps UFC Top of the Class showcases a nice design with quality stock. 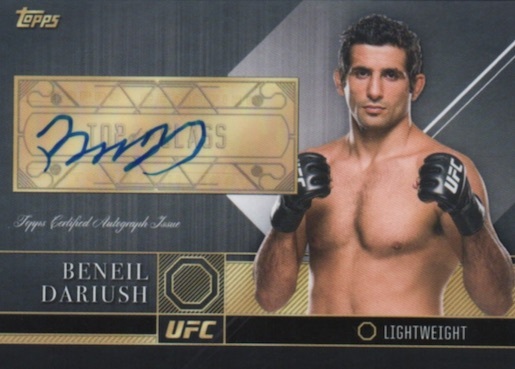 Fighter images pop on the autographs and relics and the sticker is incorporated well for the signed cards. Unfortunately, that is one of the few positives of the release. First of all, the sticker autographs and autographed relics are not numbered. With only five cards in a box and two autographs, I would expect to know the print runs, especially since the main relics are numbered. Aesthetically, I don’t care for how the relic piece is slightly askew or the tiny slits that border the main piece. Also, if you say “Jumbo” relic, I am expecting a very large relic piece and I did not feel that was delivered. Other than the three hit designs, the only other option comes as a basic insert. Taking the set name, Top of the Class features a black-and-white image with a banner across the midsection of the fighter. While the design is fine, given this is two of the five cards in the box, I would expect a little more quality than simply a thick card stock. It was also a little disappointing that the promised parallel was just an unnumbered black fade background that I missed the first few times I viewed the cards. 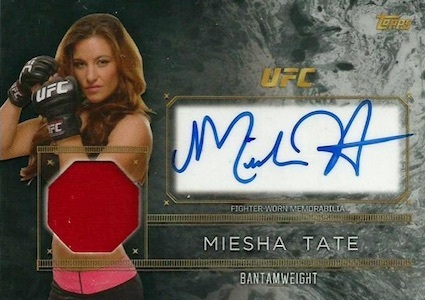 While Miesha Tate does have on-card autographs in the set, she appears to be the only one, which is an odd decision. One is better than none, but why would this be the plan? Given the name, you would expect Top of the Class to only have the very best current and former fighters in the checklist. Although there is top-level talent, there is also much more of the low-end subjects, including a few head scratchers. To make these sets stand out, the checklist needs to be tweaked as most UFC sets feature the same names over and over. CM Punk is the one fresh face for UFC collectors, which does add something new. On one hand, the price is moderate and the two autographs and one relic box hits are a solid yield. However, if boxes regularly contain just $10-20 in value, and there is not something else to point to like a base set, notable rookie cards or a unique insert or design, it is hard to get any real monetary or collectible value unless you hit a low-numbered autograph/relic or one of the few elite signers. A middling checklist and nice, but unremarkable, design ultimately means that collectors would be better off buying singles or waiting for the inevitable price drop. As stated, CM Punk is a nice addition as are the on-card autographs for Tate. Both help the value slightly. The break itself was brief and not really memorable. With so few cards to make an impression, there needed to be a wow factor. 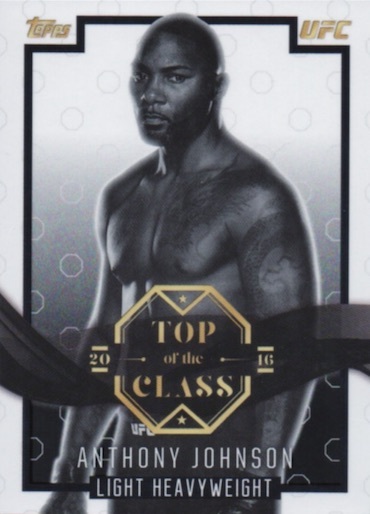 2016 Topps UFC Top of the Class has nothing like that and the fun suffers. Despite this, the quality and overall look of the set did come across well. It just did not seem there was much else to it and that is the main issue for me. Same junk, as always with topps. This time it’s just thicker cards, bunch of no name fighters, don’t waste your money. Also, who thinks to put 49 cards in a set? Mixed mats and fighter worn together in a set? Topps you really need to come up with something new please! The auto’s I have seen are all low end $3 stuff, same with the relics. Again, don’t waste your money!! 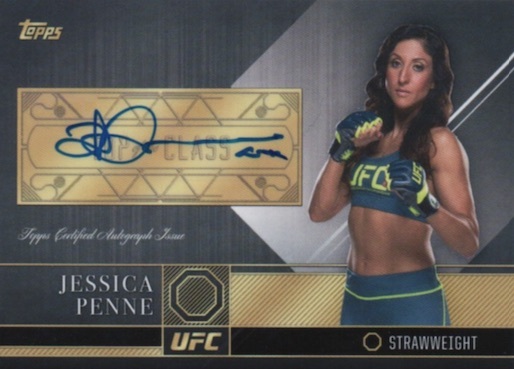 5 boxes later and I can safely say its “Top of the Class” in name only, especially when Jessamyn Duke (back in Invicta FC and still losing) is on the checklist. 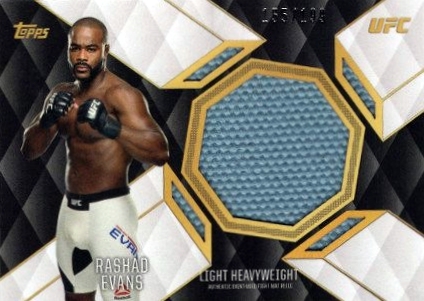 Its a shame, I like the classy design and thick stock, but its the same old sticker autos (bar Miesha Tate, bless her) and mid-tier fighters you get with every UFC release. At least Topps have appeared to give up on redemptions, much like I’ve given up on those Overeem autos I’ve been waiting on for 3 years. I wish I would have read the reviews before purchasing. Luckily I only bought 1 box. The cards are a thick stock and have good design. Besides lack of value, my biggest complaint is the outside of the box says 1 insert and 1 parallel. So, you figure you should get 1 low #’d card. Nope. The base jumbo relic (1 per box) is #’d to /199. However, Topps counts this as a parallel. At least at only $45 per box, you can just lick your wounds and move on. How the hell do you sleep at night? This product has followed the same downward trend of their UFC products. When I first heard about this release I was excited as it sounded like a Panini Signatures product which boasts a decent value in a limited card (5 or less) release however was disappointed. Yes, the relics are “low numbered’ but not what you would expect with a small card number release product. FYI Topps 199 is NOT a low count. 2016 Topps UFC Top OF The Class Factory Sealed Hobby Box-CASE FRESH!-3 HITS PER!